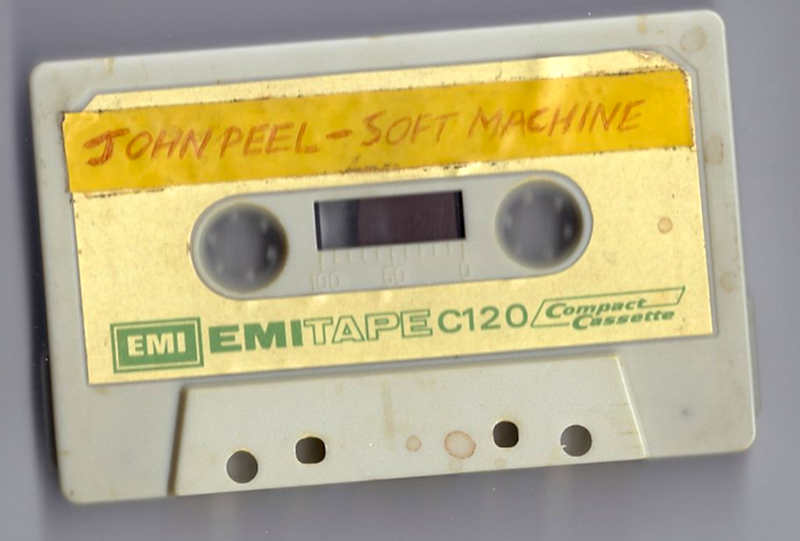 Back in 1976 John Peel did a ‘Soft Machine Special’ show on Radio 1. This hour long show featured tunes by Soft Machine, Kevin Ayers, Robert Wyatt, Gong, Isotope, Euterpe and many other bands. It really was quite brilliant and here you can download it in mp3 format. I have now got an mp3 audio file from a cassette that I made on the 17th August 1976. The recording isn’t brilliant quality as my radio was an old Ekco Nautilus PT310 and my cassette recorder was a mono Phillips N2225 and I made the recording 37 years ago! I still have the EMITape C120 cassette. On the other side I recorded ‘Livestock’ by Brand X – oh what strange music I was into when I was 14! I seem to remember there was always a problem with ‘mains hum’ if I ran my radio off mains, it was OK on batteries but I guess I couldn’t afford any at the time. There was also a problem when the motor used to kick in on my parents fridge, so there are a few odd noises in there too. When these momentary blips of interference occurred the automatic gain control on the cassette recorder would temporarily turn the recording volume down. I thought I had the edge over all my friends efforts at recording off the radio in those days as I had an FM radio, so be thankful for that. As I say, the recording of it isn’t brilliant, but I believe it is the only intact copy of the radio show available online today. This is the most important radio show that I have ever heard in my life, and it changed my life. I really haven’t been the same since, I think that is a good thing. This was definitely my first introduction to the music of Kevin Ayers and the radio show includes; Stranger in Blue Suede Shoes, Joy of a Toy continued, Everyone Knows The Song and lots of other tracks where Kevin was involved. I’ve stored the mp3 safely in my Amazon Cloud Storage, if you want a copy just enter your email in any of the ‘get updates’ fields on this site and I will send you the download link. Please comment below, I’d love to hear what you think. Thanks for the offer. It will be wonderful to hear the radio show. Hey nice to hear from you Curtis, I’ll try and sort the recording out this afternoon. John you should now have an email with a link you need to click, just do that and you will be sent the download details straightaway. You´re very nice sharing your appreciated treasure with us. First heard Soft Machine when Big L played ‘Love Makes Sweet Music’. I was even more mightily impressed when Jack De Manio interviewed them on Radio 4’s ‘Today’ programme, tho’ I didn’t know that Robert (Wyatt) Ellidge’s mum was BBC scriptwriter & Woman’s Hour broadcaster Honor Wyatt (see also http://www.robertgraves.org/issues/15/6367_article_247.pdf, which sets out her cultural credentials) & that favours had almost certainly been asked. But it was the Soft’s Prom appearance in 1970, on a night programmed by Tim Souster, that set me by the ears. I played my dodgy open-reel recording of that still-stunning set any number of times as a keen ‘teenage avant-garder’. Unfortunately, the ousting of Robert Wyatt (total madness! why, oh why?) knocked most of the individuality & quirkiness out of the group, &, especially after the dead hand of Mr Karl Jenkins had fastened on their throat, they became, to my ears, yet another bunch of jazz-fusion, more-notes-per-minute merchants. I’d love to hear your dodgy Peel tape. Fortunately for you, you won’t need me to upload my crap Proms recording, since the gig has been released at least twice – once on vinyl in the late ’80s by Reckless Records & more recently on the Blueprint ‘Live 1970’ CD, with the music’s origins deliberately left vague to avoid acknowledging the infringement of BBC copyright. Dear Mr Alien, thanks for the comment. You should have an email by now with a link in it, click that and you will get access to the dodgy tape. Oh man! No words, it’s just great! I felt like I was in the 70’s and I’m only 17 years old hahah, it’s great! I heard many of these songs but there are some songs that I never heard and they just blew my mind! Many Thanks! I have a recording of Kevin playing at Mr. Kyps in Poole, Dorset on 25th October 2002. I can DropBox it if you like. Also, please do send me the URL for the John Peel show – I do have all the tracks I’ve heard on the video, but it would be nice to have them all without the gaps! Hi Terry, I sent you an email with some info in – did you get it? I’m rather excited about hearing the Poole gig. would love to hear this… can you send me the link to the peel sessions tape please? Soft Machine was the first live band that I heard in concert when the opened for Hendrix at SUNY Stony Brook in March ’68. I was fortune to catch them again on Aug 23 1968 at the Singer Bowl. Had front row seats! Those two evening are with me to this day. I’m interested in the Soft Machine radio special MP3 link, as well. I’ve been a long-time fan of the Softs and Kevin Ayers solo work. I bought “Odd Ditties” on LP in the late-70’s, and it was a life changing event for me also. Please send me the link. I would love to hear it!!! Thank you, Rick. It’s a wonderful broadcast!!! Oh my gosh, I would LOVE to hear this!!! I hope it’s not too late! I just found this beautiful, amazing blog moments ago!!! Well…either way….thank you so much! I’m loving the blog! Wow !! I’ve been a fan of Kevin Ayers since the seventies, the Soft Machine and Canterbury scene too. Finally got to see Kevin in Norwich in 2005. Would love to hear this radio show. Could you send me a link ? Sorry about the delay there Jim – check your email now. thanks for sharing….looking forward to hearing the show. does it include anything from when percy jones was in the softs? If you’re still patiently sat at the other end of this email address (!) & are able to send me a link for Peel’s Soft Machine Special then yes, please do, I’d really love to hear it. I just sent you an email, there’s a link in there that will send you all the downloads we have so far. Sorry it took so long for me to spot your comment. should I have to wait 100 years? It would be wonderful to have a copy of this recording. Do share the link with me please. I would really like to hear the 1976 John Peel Show special, and the Poole gig if possible. Oh I got the links to the MP3 – thanks you very much. Thank you, Rick! I’m just listening to the 1976 Soft Machine special. What a treat! Wonderful offer. Thanks so much. Can’t wait to hear it. Check your email Vince – there’s a link there you need to click to take you to the download page. I would be pleased to receive the link Rick. I would really love to hear this show again, after so many decades. I taped it at the time, and played it many time over, but the tape did not survive…. Can I have it, please? You should have an email about it now Luke. Would love to receive a link to the1976 John Peel Show special. Thanks a lot. this is fantastic iam well pleased and gratefull for it, if i could offer you a medal. Thanks for the link and for preserving an important moment in time. as a longtime collector of The Police I would like to know if Andy Summers palys on some of the tracks that were featured in the John Peel Show. Yeah, John Peel was a big influence on my listening to music as well. The show was also (here in Germany) oon the FM channel BFBS (British Forces radio) so once a week I listened to/recorded John Peel with my little tape recorder. A very diverse style of music – and finally I found my 2nd best band of all times there: Hüsker Dü!